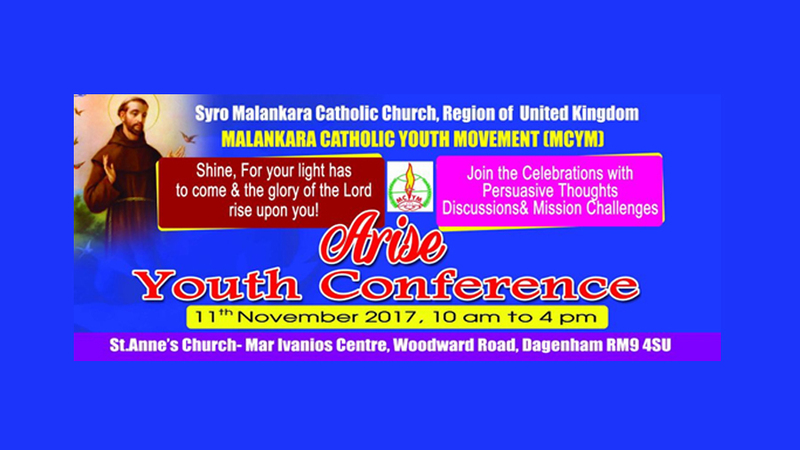 Malankara Catholic Youth Movement of the Syro Malankara Catholic Church UK is conducting a youth conference at the Mar Ivanios Centre on the 11th of November Saturday at St: Anne’s Church, Woodward Road, Dagenham, RM9 4SJ from 10am to 4pm. Conference will be begin with Holy Eucharist celebrated by Rev. Fr. Thomas Madukamootil at 10 am and conference to follow. Aim of the Conference is to empower youth from the age of 15-35 to open up to Christ, discussing overview of MCYM, challenges youth’s currently face, how church plays a role in upbringing their spiritual fullness.